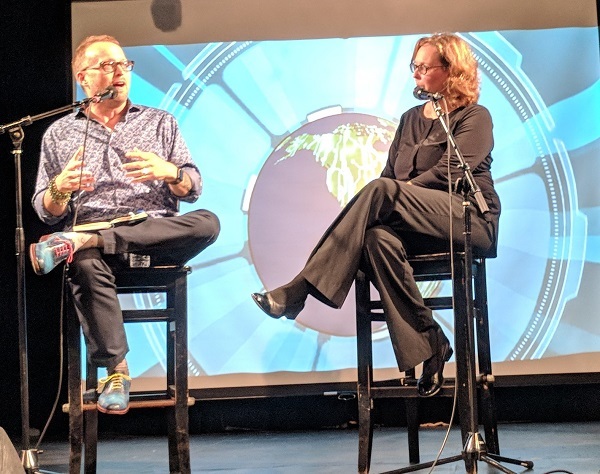 MIMA Event: Conversations About the Future of Advertising (CATFOA) with Jen Faucon was held on August 16, 2018, at Amsterdam Bar and Hall, St. Paul. Capping off the Summer of CATFOA, Jen Faucon, Chief Customer Success Officer at Codelattice, delivered an impassioned pitch for the importance of AI, Bitcoin, and Blockchain, in creating global connectivity, solving real business problems, and making the world a better place for everyone. Here is a recap of her presentation and conversation with Tim Brunelle, former MIMA President, and CATFOA founder. The digital explosion has provided people in the emerging world with connectivity, and connectivity has enabled opportunity. While living in Southeast Asia and the Middle East, Jen was amazed to realize that despite fundamentally different cultures and lifestyles, technology gives us a shared platform. In a remote village in northeastern Thailand, a bead craftswoman used her iPhone to make mobile payments, safely transfer money, and partake in the e-commerce market. “Here I was in these cultural moments, but really everybody was just like you and me”, Jen said. Jen is a believer in harnessing the power of the digital explosion: AI, Bitcoin, and Blockchain. Her tips? Learning all the time – she reads and researches 20-30 hours a week! With examples from the public and private sector, Jen demonstrated the benefits of incorporating AI to predict and deliver on customer experiences that are rich and rewarding, from increasing customer satisfaction at a TGI Friday’s to helping refugees on the run. Whereas we put emotions and biases on the decisions we make, from conscious to subconscious and important to trivial, the computer program can go through reams of information without being swayed by opinion. A proponent of cryptocurrencies, Jen sees them as especially helpful in emerging markets where there is volatility. Bitcoin is the first of its kind and now there are over 1000 cryptocurrencies. It is a completely democratized and anonymous system, run by the people who use it on their own computers, not controlled by companies or governments.